Both teams will be playing their first game in the group stage, and only Group A and group B have played their first matches till now. They have Jamaica and Venezuela in their group as well. 06th June 2016 at 05:30 (IST). The University of Phoenix Stadium, Glendale, United States of America. Mexico is ranked 16th in the FIFA world ranking as of now and have a very strong squad with them. Their coach Juan Carlos Osorio have picked his team very tactically, and the players to look out for are Rafael Marquez who plays in the Mexican club Atlas. then we have Javier Hernandez who plays in the German club Bayer Leverkusen and has had an excellent season as well, the we have Hector Moreno who plays in the Dutch club PSV Eidenhoven and then we have Andres Guardado who plays in the Dutch club PSV Eidenhoven. The squad is very strong overall, and if they play with proper coordination, Mexico can be very deadly. 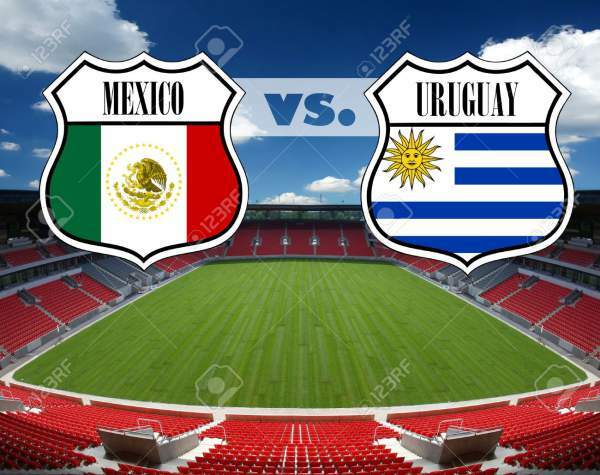 In their last five International friendlies, they have won four and drew one, drew against Argentina by 2-2, won against Panama by 1-0, against Senegal by 2-0, against Paraguay by 1-0 and Chile by 1-0. They played against Chile in their last match and won the game by 1-0 as Chicharito scored in the 86th minute of the game. Chile had dominated the possession as they had 6-% of it whereas Mexico had 40% and Chile had 22 shots out of which three were on target whereas Mexico had six shots out of which two were on target. Uruguay is ranked ninth in the FIFA rankings and is a very strong team to play against. Their star players are defender Diego Godin, who plays with the Spanish club Atletico Madrid, Luis Suarez, who plays with the Spanish club Barcelona and Edinson Cavani who plays for the French club Paris Saint-Germain. They played against Trinidad and Tobago in their last game and won the game by 3-1. Talavera, Aguilar, Araujo, Corona, Nilo, Jimenez, Reyes, Herrera, Layun, Corona, Peralta. Silva, Pereira, Alvaro, Victorino, Silva, Lodeiro, Vecino, Rios, Sanchez, Rodan, Cavani. Next articleMiss USA 2016 Top 15 Finalists: Check Results and Who Won Tonight?